In matters of the heart, our boys are all boy. When it comes to demonstrating emotions toward each other, that demonstration usually takes the form of a punch or a blind-side tackle. Sure, they play and joke together, but when one inspires a deep feeling within another, that feeling is generally somewhere between annoyance and anger. That’s what makes it so much extra soft and fuzzy when the moon turns blue and they show some genuine warmth for each other. Last weekend was Big Brother’s league basketball tournament. This was the biggest tournament of the year, and he had been looking forward to it. The Thursday before the tournament, Big Brother got sick. We thought he’d be better in time, but when he woke Saturday morning it became clear he wouldn’t be able to play. Big Brother didn’t look like he was going downstairs in the next few minutes, so I just went down with Buster. “Can you get me paper and a pencil?” Buster asked, leading me toward the drawing paper the boys use to make birthday cards for their friends’ parties. He told me his thoughts and I spelled the words for him. He wrote the letters as I dictated. 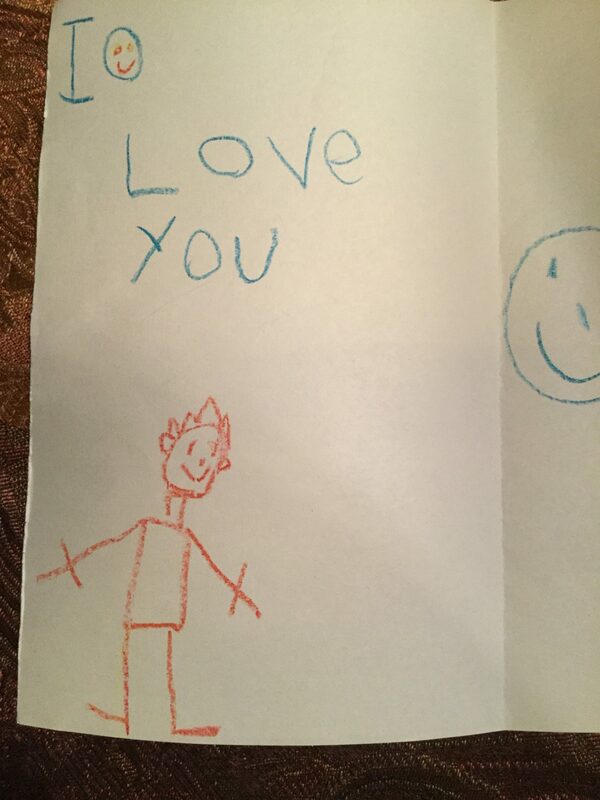 The best cards are made of crayon on paper. All the words were his. Only the spelling was mine, except for the word “BAeTter” where he kind of got ahead of me. It didn’t matter. The meaning was clear. A mouthful for a boy to say to his brother. Big Brother came downstairs. Buster made me stand guard so Big Brother wouldn’t come into the dining room. When Buster was finally done with the illustrations, he handed the card to Big Brother with the understated, brotherly tenderness that comes with the single word: “Here.” “Here” is the most caring word in a boy’s lexicon when it accompanies a hand bearing a heartfelt gift. Big Brother read the card. He didn’t know how to react. At last, the brotherly instinct took over. His face brightened just a bit. “That’s really nice,” he told Buster. He put the card down on the coffee table and life went back to normal. Everything that needed to be done or said was done and said. The exchange lasted a brief instant, and that was exactly the right length for it. If it had gone longer, it would have turned fake. This was real, and it had to be allowed to sink down underneath, where brothers keep it. 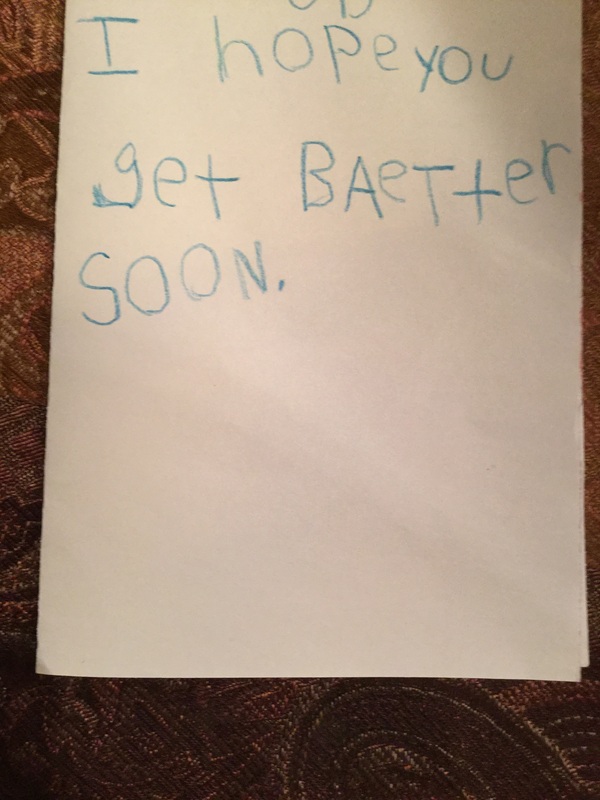 This entry was posted in It's a Guy Thing and tagged basketball, boys, brotherly love, brothers, children, family, humor, illness, parenting, siblings. Exactly! You may have to dig a good ways down to find it, but it is there! Just to let you know I grew up with five brothers. So I know all about how boys can be let me tell you! I grew up with four. My three sisters weren’t any better. It’s like the dawning of the Age of Aquarius or something. That is just so precious. My eyes might be leaking. You should have that checked out. It sounds serious. Right?! Like what kind of conditions does your blog cause?! People have told me it causes drowsiness, but no serious ailments . . . until yours. These posts might need to come with a warning of potential side effects! Do not drive after reading, could cause leaky eye..
Our corporate law firm is working out the language. The primary word in the Language of Love for boys. Genuine brotherly love—minus all that frilly stuff. That’s not how to spell, baetter? You mean I’ve been spelling it wrong all these years? You’ve been pronouncing it wrong too.